One million households have failed to register with the beleaguered semi-state company Irish Water, the Irish Independent has learned. Just 500,000 people have signed up with the utility, and the low take-up has forced it to seek permission from the regulator to extend the registration deadline to November 29. A new board, due to take control from the end of next month, will be told to review the controversial performance-related pay model which has caused widespread anger. Senior executives were coming under mounting pressure last night, as the Government parties fear the introduction of water charges is a barrier to a second term in office. But Finance Minister Michael Noonan risked further ire by suggesting that water charges are "modest". Backbench TDs are increasingly concerned that problems in Irish Water will cost them at the next election - particularly after it emerged that senior managers in the company are in line for bonuses of up to 9pc, worth around €9,000 a year, even if assessed as needing "improvement". A select group of 27 senior staff also enjoy a €10,000 annual car allowance and health insurance worth up to €2,700 a year. The car perk is taxable, and is paid in lieu of mileage expenses. • The delay in setting the water tariffs, only finalised the day before charges came into effect. • Question marks over the level of Government funding. • The short time-frame needed to establish the company, which will ultimately have as many as 1.5 million customers. PAC chairman and Fianna Fail TD John McGuinness said: "The board of Irish Water should all go now. They have already lost the confidence of the Irish people." Fianna Fail leader Micheal Martin warned the coalition parties against seeking to "scapegoat senior management" instead of confronting their own policy failures. "The public have no confidence in this organisation, but they know that this is because of the task Irish Water has been given rather than because of individual personalities in the company,"he said. Irish Water insists that its performance-related system will reduce overall payroll costs, but it is set to be reviewed after Taoiseach Enda Kenny said it “must take into account the public interest”. A similar salary model operates in the company’s parent, Ervia, formerly Bord Gais, which is credited with reducing costs by €34m over four years. “The pay model which operates at the moment in Bord Gais, and which will operate in Irish Water, does need to take into account the public interest and public understanding of what is actually involved,” Mr Kenny said. Irish Water’s board will reach the end of its term in office on November 30 next, and a joint Ervia/Irish Water board will be established to oversee operations in both companies. A board meeting of parent company Ervia today will examine the performance of senior executives, including managing director John Tierney, as some 1.5 million people prepare to receive their first water bills in two months’ time. The Cabinet will also discuss the ongoing controversy which has led the political agenda in recent days, and which has taken the focus away from last week’s Budget which was broadly welcomed for giving something back. Mr Noonan said he was getting positive feedback on the Budget, but risked a further backlash when he said water charges are “modest”. “We are also committed to having a modest charge on water because it is such a scarce resource. I think it’s recognised internationally that the best way to manage a scarce resource always is to have charges on it,” he said. worried about how Irish Water was being perceived by the public. “There is a concern amongst my colleagues and indeed myself around the whole area of the perception of Irish Water. It is a new company, an important facility, but there are a lot of questions around exactly how people are paid,” she said. Transport Minister Paschal Donohoe pointedly refused to back Irish Water boss John Tierney, saying he was reluctant to “personalise” the issue. Government sources said the new board would be instructed to review the pay model. Environment Minister Alan Kelly has asked Irish Water for a comprehensive overview of its communications and stakeholder engagement strategy, and more resources will be diverted to its call centre to reduce waiting times for member of the public. In addition, local authorities may resume taking calls from the public relating to minor works to be carried out, such as ruptured mains. Details are expected to be announced shortly. 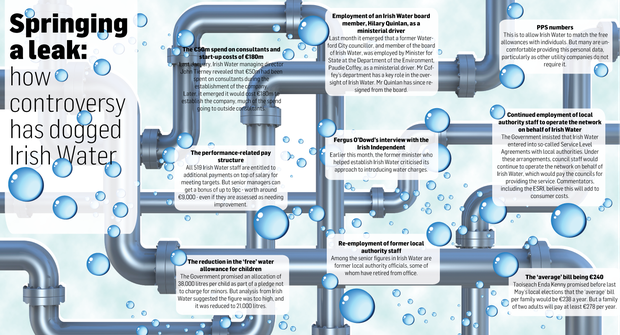 Members of the Irish Water board were appointed in July and November 2013. Board members are chosen by parent company Ervia, but approved by the Environment Minister and Minister for Communications, Energy and Natural Resources. The new board structure will be agreed between Ervia and the Government.